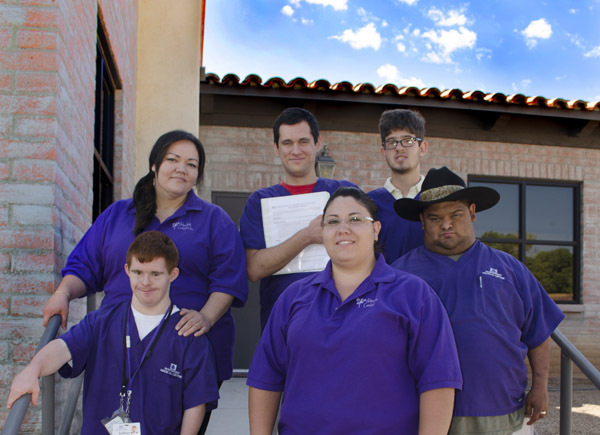 Employers – Achieve Builds Confidence, Inc. Achieve participants have been actively employed in the community both as volunteers and as paid employees. Our participants and their accompanying job coaches continually embrace your corporate culture and high service standards of the organization. Employers have consistently echoed praises for the participants, commending them on their hard work, dedication and thoroughness. In addition to having some great individuals in their team, by hiring Achieve participants, employers benefit through yearly tax deductions. Also, throughout the duration of the GSE program- employers are free of any liability, unemployment, workers compensation, or insurance commitments for our participants. For every two participants an employer hires, Achieve, Inc. provides a certified and trained job coach to supervise, train, and work along with the participants. The job coaches possess the necessary communication and leadership skills to ensure that daily business activities are properly executed. Job coaches also teach participants to stay compliant with company rules and standards-to respect fellow employees, management and company culture- and to properly follow instructions to become a reliable team member. Above all, since we compensate the job coaches, they are available to available to do any extra work there might be, without adding to the employer’s payroll. However, this is only possible at a 1:2 (job coach: participant) ratio. PARTNER WITH US TODAY AND FIND OUT HOW AND WHY AN ACHIEVE INC. EMPLOYEE CAN BECOME A WONDERFUL ASSET TO YOUR CORPORATION.